Around the turn of the century, we were working at an alternative weekly in San Francisco with a colleague who claimed to have worked with “South Park” creators Tre Parker and Matt Stone at a Colorado ski resort before the two had animated their first takes on Kyle, Stan and the rest of the boys (FWIW, we have no reason to doubt him, we just weren’t there, ya know?). “You’re not gonna believe this, but those guys smoke more than any human beings I’ve ever seen since,” he said. Actually we totally believe that. But given the creators are such enthusiasts, “South Park” is relatively light on cannabis references. Maybe it has to do with Comedy Central’s standards and practices (we doubt it), or the fact that fourth graders simply don’t smoke enough to sustain a plot (more likely), or the fact that cannabis can be a comedy crutch and Stone and Parker have more to say (bingo). But there have been herb-driven episodes of the animated juggernaut, which begins its 21st season tonight. Here are the three best. Not just about cannabis, but in keeping with classic South Park episode structure, it was the secondary story (the best episodes usually run two plot lines at the same time with the secondary being the same joke told many ways over and over). 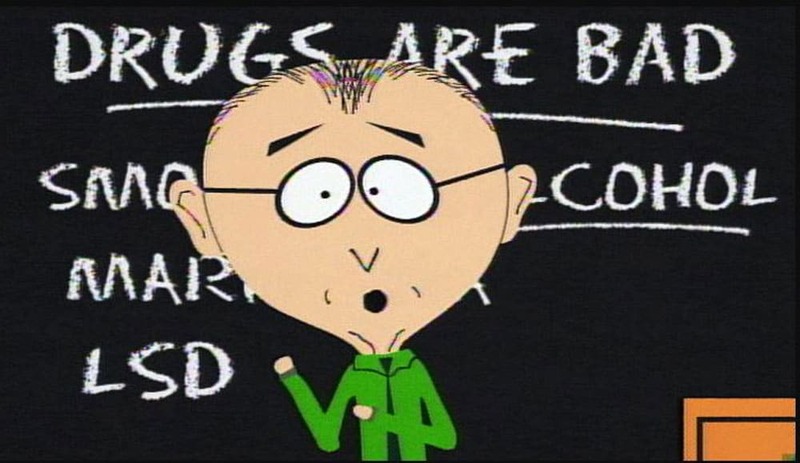 Mr. Mackey, the school counselor of “Drugs are bad, mkay?” fame gives a lecture to the children on drugs … er … being bad, mkay? To drive home his point, he passes around a sample of lit cannabis so the kids will know what it smells like. It never makes it back to him and Mackey loses his job as a result. Because it’s “South Park” this leads him into a downward spiral that (of course) leads him to becoming a hippie (cardinal sin on the show), deciding to marry a hippie girl, and honeymooning in India. There he is captured and put into rehab where he emerges clean and gets his job back. 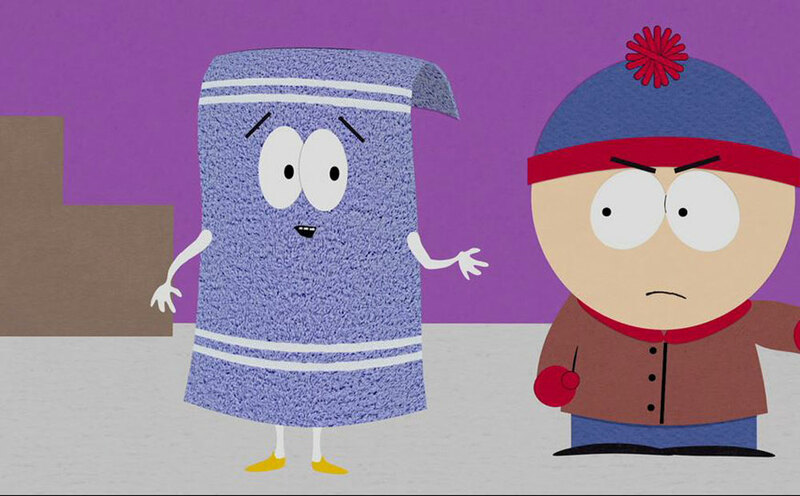 The series’ only true stoner, an anthropomorphic towel with the catchphrases “Wanna get high?,” “I have no idea what’s going on,” and especially “Don’t forget to bring a towel.” While he would appear infrequently in subsequent episodes (including an intervention in 2010) this is an origin story. One that involves the boys, the military, a secret government plot (of course), and eventually aliens trying to take over the world (even more of course). Though Towlie’s drug of choice is cannabis he eventually slides into crack and meth use in subsequent episodes (Note: this is a cartoon. Please don’t cite this as proof of cannabis as a gateway drug, especially if you happen to be Attorney General of the United States). The episode also featured a fake ad for Towlie merchandise, though the show later sold actual merch thorough its website. It appears those items – including an actual Towlie towel – are no longer for sale. The episode where “South Park” squarely takes on the issue of legal cannabis is not only spot-on, but one of the funniest of the series. Allegedly inspired by a real-life Los Angeles dispensary that set up shop in a closed KFC, it follows Randy, Stan’s dad, as he tries to secure a prescription for medical cannabis. Randy assumes healthy patients qualify. When told this is not the case he tries to give himself cancer, eventually putting his testicles in a microwave (no clue how he shut the door or got the microwave to work with the door open, but it is a cartoon after all). This gives him testicular cancer and gets him his needed script. The downside (aside from, you know, testicular cancer): His testicles continue to grow to the point where he eventually uses them as a bouncy ball to get around town. This isn’t an issue until they grow so large he has trouble getting them through the door of the dispensary. The images are among the very best visual jokes the series has had to offer. The secondary story has Cartman entering a black market to manage his fried chicken addiction. We’re all addicted to something. This entry was posted in Weed. Bookmark the permalink. Cannabis News, Reviews, Culture, Recipes and more! Are Kilos Of Legal Marijuana Being Diverted To Illegal States?